The Burpee Seed Catalog is the mail-order arm for Burpee Seeds, America’s leading seed supplier for more than 135 years. The catalog is mailed annually in December. 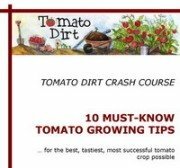 It offers seeds, vegetable plants, flowers, perennials, herbs, and heirlooms, fruits, organics, seed starting supplies, and other gardening supplies. Seed and plant descriptions are detailed and are accompanied by photographs. You can receive the catalog free of charge or view it online. Seeds and plants are available for all growing zones and for all seasons. Burpee guarantees products with a refund or product replacement anytime within a year after purchase. Burpee is a family-owned company. While heritage seed preservation and heirloom seeds are growing increasingly popular, the W. Atlee Burpee Company was built on innovation – a tradition that continues today. The Burpee seed catalog includes the latest varieties, new hybrids, and certified organics for the home garden. Hybridization and selective breeding means seeds have improved yield and disease resistance. 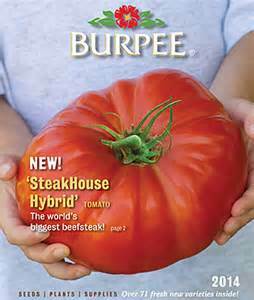 Recently, Burpee also re-introduced heirlooms to its seed catalog. Burpee seeds are not chemically treated, making them suitable for sustainable gardens. Moreover, its seeds are not GMO (genetically-modified organisms) – a mistake often made when consumers confuse hybrids with genetic modification. What launched the famed Burpee Seed Catalog? W. Atlee Burpee’s well-established Philadelphia parents expected him to follow in his physician father’s footsteps. But as a teenager, young Burpee developed a passion for livestock breeding. He started a mail-order livestock business with a $1,000 loan from his mother. Soon, the story goes, satisfied livestock customers asked him to recommend good seed sources in order to grow healthy feed; local sources were consistently low in purity and germination rates. Burpee saw an opportunity to expand his livestock business. By the 1880s, the W. Atlee Burpee Company was supplying the northeast and midwest states with seed as well as livestock, making it the world's fastest growing mail-order seed company. Since many of Burpee’s customers were transplanted Europeans, he made it a point to visit Europe each year to collect seed sources, study varieties, and take notes in a journal, which became the foundation for the coming year’s new seed catalog. Free mail service at the time ensured the catalogs were delivered to customers’ homes, even in rural areas. Two of Burpee’s goals for his company were high quality and reliability. Yet many seeds he acquired in Europe struggled to adapt to American growing conditions and performed poorly on this side of the Atlantic. In 1888, Burpee purchased a farm named Fordhook near Doylestown, PA which became a living laboratory for his seed breeding projects. Breeding propelled the company to become the largest seed distributor in the world by the 1890s – in fact, Burpee is known as the first breeder to hybridize vegetables. Innovation was a key to Burpee’s success and continues to drive the company today. At Burpee’s death in 1915, the catalog was 200 pages long and was distributed to a million customers every year. Burpee’s longevity has allowed the company to build a good reputation lasting more than 135 years. Its fans like the company’s selection and consistency – interestingly, two qualities also cited by dissenters. Self-labeled purists dislike Burpee’s emphasis on selling hybrid varieties. To that, Burpee explains its position on innovation, constant improvement, and the productivity that hybrids offer. Other critics mistakenly complain that Burpee sells engineered seed. When customers complain they are the victims of mislabeling (as when Burpee has sent a specific seed that produces an altogether different plant) the company is quick to offer its a 100% satisfaction guarantee policy: if your seed packet has a low germination rate or plants aren’t healthy when you open the box, Burpee will replace them or provide a refund. Ownership. Is Burpee owned by Monsato, the agricultural biotechnology giant which produces genetically-engineered seed and herbicides, among other things? No. Former Burpee employees and family members of employees have worked for Monsato and its subsidiaries (Seminis and PetoSeed), but Burpee is currently owned by George Ball, Jr. who purchased it in 1991. Size. Is Burpee too big? Burpee is a classic example of the American dream. It is a formerly small company that became successful through hard work and innovation. What its future holds is in its own hands. You can view Burpee seed catalog covers all the way back to 1886. Sometime in the 1950s or 1960s, covers switched over from artwork to photographs. Need we mention that over the last 10 years, tomatoes have graced the cover?